1. What is an Organization & Location? 2. 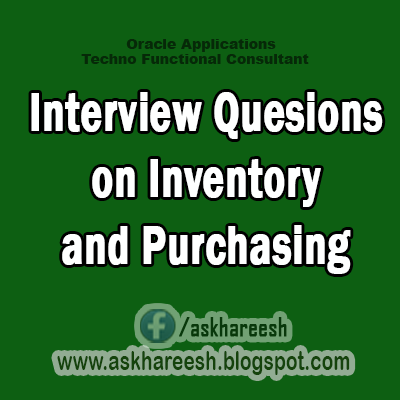 What are the KeyFlexFields in Oracle Inventory Module? 3. What are the Attributes of Item Category & System Items? 4. What are the KeyFlexFields in Oracle Purchasing & Oracle Payables? 5. What are the KeyFlexFields in Oracle HumanResources & Oracle Payroll? 6. How would you create an Employee (Module Name) Describe? 7. What is a Position Hierarchy? Is there any restriction to create that? 8. To whom we call as a Buyer? What are the Responsibilities? 9. How do you Setup an Employee as a User – Navigation? 10. How many Approval Groups we have? Describe? 11. Describe the Types of Requisition? 12. How many Status's and Types For RFQ's & Quotations Describe? 13. How many Types of Purchase Orders We Have? 14. What is a Receipt? 15. What is Catlog Rfq? 16. Give me online about Planned Po? 17. How can the manger view the Approval Documents Information? 18. Whether the manager can forward to Any other person? How? 19. Can u resend the document your subordinate how? 20. What is Po Summary? 1. It is a Ware House Which you can Store the Items, And You can setup your business Organization Information Like Key Flexfilelds,Currency,Hr Information and starting time and end time. Location's are like godown place, office place, production point. 3. The classification of items are Category Like Hard ware and Software, where as the Systems are individual items like Cpu,Key Board. 5. Job Flexfield,Position Flexfield,Grade Flexfiled,Costing,People Group Flexfield, Personal Analysis Flexfield. 7. It is a Grouping of Persons for Approving and Forwarding the Documents from one person to another person, there is no restriction. 8. The Employee is nothing a Buyer, who is responsible for Purchase of Goods or services. 20. The Purchase Order Summay Information like total lines, and status.